But this month's entry is not far behind that all-timer in terms of geometry-bending skill and execution. In a race-to-11 on the TV table, Mika Immonen held a 9-8 lead over Lee Vann Corteza of the Philippines. The two traded safeties, when the Finn was faced with the table shown in the diagram. 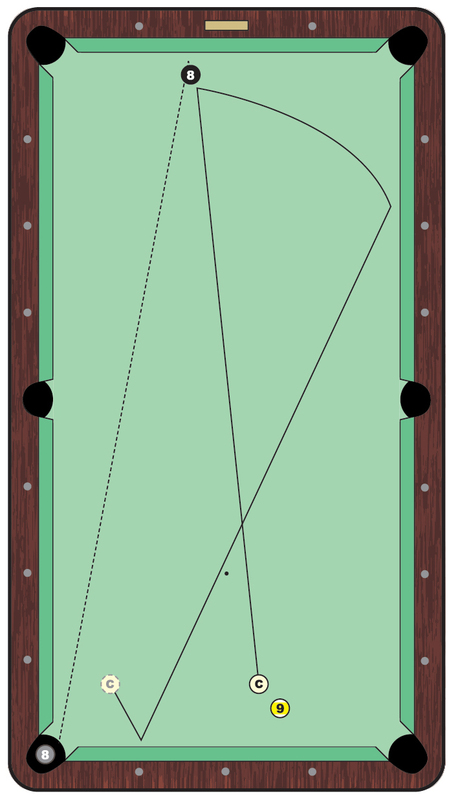 The 8 ball is nestled near the head rail, while the cue ball and 9 are sitting a table's length away. The two object balls don't offer much for a defensive option, so the potential bank of the 8 into the lower left corner seems plausible. But what about that tiny detail of position? Immonen loaded up on draw and aimed just a smidge left of a full hit on the 8. He drilled the object ball straight off the short rail and into the bottom corner. The cue ball headed parallel to the head rail before the backspin bent its path toward the second diamond on the left long rail. The cue ball then rolled off the foot rail and into perfect position for the game-winning 9. The stroke necessary to maintain that kind of draw after the cue ball travels nine feet � the combination of power and speed control is superhuman. Immonen closed out this rack and the next to take the set, 11-8. But he'd have to wait two more years for his first title in Chesapeake, winning the 2008 (and 2009) U.S. Open titles.